Here's a something a bit different that I'm going to give a go here on my blog. A feature entitled "What Happened" which tries to bring some light on (or maybe just speculate) what happened to games that we thought would blow us away. 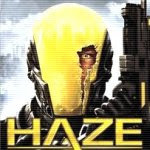 When first announced, Haze was said to be a fresh new take on the FPS genre for the new generation of consoles (360, PS3, PC) with promise of intense graphics (which some claimed would rival Crysis), heart pounding action in both single player and multiplayer (both online and off), a multitude of modes, characters, weapons, features and a story to shock all who experience it. It later switched from multiplatform to only appearing on the PS3, with loads of rumors and controversy in between announcements it spun a tale which (both positively and negatively) sent gamers into a frenzy - giving the game a ton of cover and publicity. Thus began the seesaw of controversy that is Haze. Right from the get go, Ubisoft and Free Radical Design had the right idea on promoting their product, as the premise had style. The unique look to the Mantel soldiers gave the game a special look that you would just know when you see it. The idea of drugging soldiers with enhancing substances (dubbed nectar) and creating a massive "for hire" army with them is an idea that seems very interesting and good for a story. Later they signed on Alternative Metal band Korn to write and release an exclusive track promoting the game which coupled along with the CG trailers and even music video, it seemed to be living up to expectations. The game looked spectacular in all the screenshots released, every trailer looked better and better, loads of info leaked out detailing tons of new modes and features; which made gamers either anticipate the title, loathe it or at the very least raise an eyebrow to this upcoming gem. As far as gamers were informed, the title was coming along wonderfully and ready for a November 2007 release. Sadly it missed that date and was delayed, with more time needed to further improve the game cited as the cause. No specific date was given to the gamers eager to play the title, though word had spread that an early 2008 (February) would be most likely the date to look for... which came and went. Later the team announced the game was still being polished and eventually pinned a mid may 2008 release date as the final date for gamers to expect to get their hands on it. During this time, Haze was being shown off at different game conventions and shows as well as privately. Previews were released over the internet, in magazines and more or less said praising things about the upcoming game. Some concerns were injected in various previews - about A.I, collision detection and over all random glitchiness - which should of set off more alerts and red flags than it seemed to. These concerns usually were shrugged off as "unpolished - to do items" which were expected to be finished up for the final version of the game. After all the hype, the amount of time taken to polish up this beast and the promise that because Free Radical Design was behind it, they could of at least pulled off a decent game - we get what seems like a rushed, by the numbers game that oozes potential and yet never reaches for it. So what really happened behind the doors at Free Radical Design? We will never know it seems. Will Haze feature a sequel? Perhaps a remake? Chances are no, it will not. But who knows, maybe they'll be able to grab this franchise from the grave and inject it with just the right amount of nectar to make it good, someday.